Drikung Kagyu school, a sub-school of the Kagyupa school of Tibetan Buddhism. Since 1999 Holger Neuwirth has been in charge of several research projects focusing on the documentation, analysis, reconstruction and other aspects of preservation of sacred architecture of the 10th to 15th centuries in the Western Himalayas. The projects in question were funded by the Austrian Science Fund (FWF). Members of Graz University of Technology conducted the work under Neuwirth’s guidance. The analysis, which was based on specific research results, primarily sheds light on the complexity of Buddhist architecture in the Western Himalayas, especially the connections between building aspects such as construction principles and materials as well as aspects related to content and aesthetics like proportion and shape. Those elements are equally inherent to architecture as they are to visual arts, sculptures and paintings. A first field research project of the temple complex and its surroundings was started in 1998 with the financial aid of Edoardo Zentner, Zurich. With the help of FWF this research could be continued in 2000, 2003, 2004, 2005, and 2009. This book presents the cumulative data gathered during the research programs. This book aims at generating awareness of the three storied temple of Wanla. 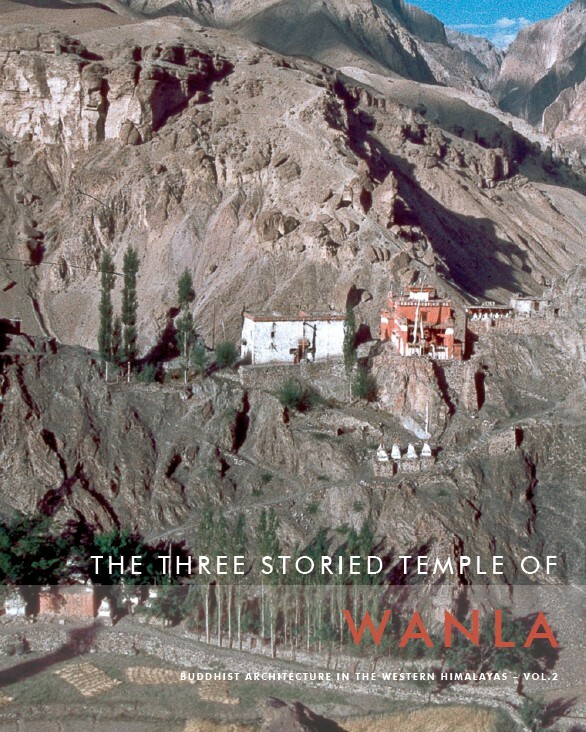 The settlement of Wanla is located in Western Ladakh on the Yalpola River, a southern tributary of the Indus River, about 68 kilometres linear distance from Leh. At an altitude of 3260 metres, the climate is somewhat milder than in higher regions and offers more comfortable living conditions. The small mountain ridge above the settlement of Wanla is dominated by the imposing ruins of an ancient castle complex that are mainly situated on a rocky crag on the north-western side. With its walls painted in red and white the three storied temple is easily recognized as a sacred building. Today it is the center of the whole complex. The path around the temple allows the ritual circumambulation. Despite the fact that Wanla is located within an active seismic zone, this temple has survived for over 700 years. The solitary position of the temple within the castle and the hints on its founder in the temple inscription indicate that the temple may have been used as both a palace chapel and a three-storey initiation chapel. Compared to other three-storey temple buildings, Wanla temple can be even described as a typologically unique palace chapel.